Apex Gaming will be demonstrating its Clover Link jackpot solution along with the iDROP cash handling solution for live gaming tables and more in London this February. Apex Gaming reports that 2018 has been one of its most successful years on record thanks to the global popularity of its complete jackpot game solution Clover Link. Clover Link is that it is available in three different versions and each with a choice of different Pinnacle slot machines. The Big Island consists of eight slots in an eclipse design, the Round Edition has four slots in a circular design and the Wall Edition is the most flexible, as it can be expanded to as many slots as the customer requires. New for ICE 2019 is the introduction of a Big Island variation with 43” Pinnacle Premium Curved slots. Operators can select from a variety of screen options, the 43” Pinnacle Premium Curved, the Pinnacle Black Series with two 24” monitors or the Pinnacle Premium Curved with three 27” monitors. Clover Link has transformed from a single-game to multi-game jackpot solution. Today it itself consists of four popular Apex titles that have been brought together in a special way. These games all offer unique features in a four-level jackpot that can include both mystery and progress jackpots, thus motivating all types of players to take part. and the Apex Player Station (APS) electronic roulette. 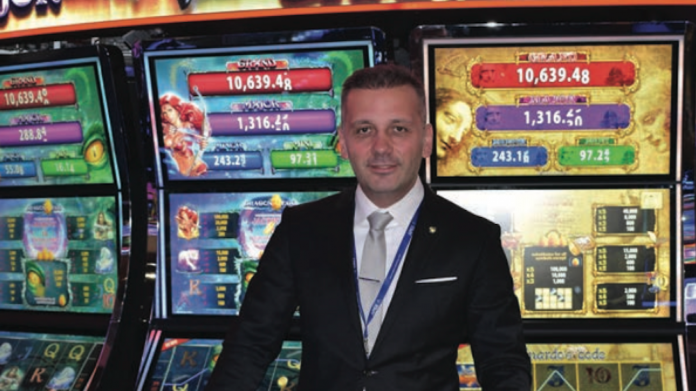 This expandable solution can be linked to up to four roulette wheels – both live and/or electronic – and opera- tors can include the EVO games on it as well, while it can also be played using the Apex Mobile Slots. Apex’s cash handling solution for live gaming tables will once again be demonstrated at ICE. The iDROP enables players to exchange their cash or tickets for jetons directly at the live gaming table. Cashing out is simple as the amount is paid out in ticket form by the iDROP. The integrated touchscreen makes it simple to use for croupiers and the fact that it is linked to the management system gives management complete control of the drop. The iDROP family has been extended with the iDROPe and the iDROPs. The latest edition, the iDROPs can manage 250 bills and tickets at one time at a validation rate of up to six per second, making it ideal when players sit at a table with a large number of bills. It also provides the casino the option to use the iDROPs to exchange a large number of bills for one Tito ticket, meaning the game is not stopped for large buy in’s and hands per hour increases. Live gaming tables and a great array of live gaming accessories, such as the Ball and Dice Tester and the Roulette Wheel Leveller with a leveling base, round off the company’s ICE portfolio, the Apex Shuffle King solutions will take a prominent position. Card shuffling plays a key role in casinos and here the Shuffle King 6 has made a strong impact as it can automatically shuffle up to six different decks of cards, while the Shuffle King 2 is the single deck option. “Please come and see us at ICE and see how we are taking gaming to the next level,” Ozer concluded.